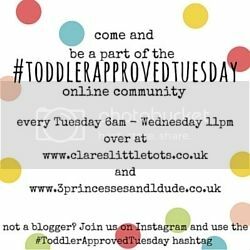 Welcome back to Toddler Approved Tuesday and thank you to everyone who linked up last week and it was great to see some of you share photos on Instagram using the #ToddlerApprovedTuesday hashtag. This week we’ve been so busy that I didn’t get a chance to blog but the lovely Nicola from Learning Toy Guide did write this lovely Letters in Soap Foam Sensory Bin. Becky my wonderful co-host from 3 Princesses and 1 Dude! is sharing a Dinosaur Adventure she took the Monsters on. My favourite from last week is this yummy looking Easy Cherry Clafoutis from Tickle Fingers – can’t wait to make this! So now it’s your turn to share your toddler fun!